As always new year starts with bombarding us with suggestions for the ‘new you’ – new diets, food fads, supplements, gym memberships – which on most occasions do nothing, but overwhelm us at the time when we need to gently transition from the season of festive indulgence back to busy lives in a cold time of the year, when body needs nurturing, not detoxing. Granted, some of those marketing tools have become somewhat less aggressive, but it still ends up putting you under pressure to ‘perform’. Instead of that, what I want to put forward for your consideration is the one tool in your arsenal that can help you make the right decisions for YOUR body thanks to the science and which can lead to profound changes and long-term benefits for you that you will see and feel. 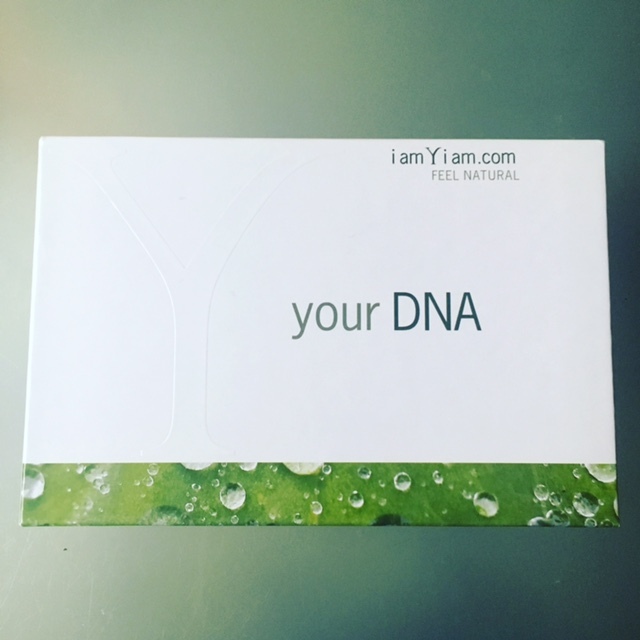 Say hello to a DNA kit called iamYiam. The company was started by Lorena Pica and officially launched in February of last year. Lorena is a woman whose boundless activity and energy hides behind a calm demeanour. She was born in Romania and as often happens, her career now, as a company founder, was influenced by her own health woes, which started with pneumonia aged only six months old and continued with an auto-immune diagnosis of under-active thyroid aged 26. Unfortunately many conditions like this are becoming a somewhat ‘norm’ in our date and age and I wonder if some of them are pre-determined not just by own genetics, but by lifestyle and environmental factors, including the food supply chain, diet and quality of water we consume internally and externally. Lorena left home at 17 to live in Germany, where she worked in business development, later moving to London and building a successful career in the investment business field. However, her health continued to cause her concern and when her GP suggested to cut her thyroid out, Lorena saw it as a challenge, as she had no desire to follow the ‘envasive’ route. She started researching the subject, which led to development of algorithms and focus on the fact that up to 75% of diseases are and can be preventable. With the spotlight firmly on data, health and genetics, iamYiam unique approach also takes into account your body’s nutritional needs, accounting for such individual factors as vitamin absorption and storage, as well as fitness. Armed with your unique DNA results, covering Diet, Nutrients, Fitness & Health, you will be able to focus of prevention, which is always better than cure. You will be able to make knowledgable choices when it comes to lifestyle, including nutrition, exercise and alternative therapies, that can be structured around your goals with the optimised efficiency plan, rather than celebrity advice or bloggers recomendations. The algorithm itself is based on 163,000 academic research papers (and growing) and genetic markers, so when you receive your DNA results and have a chance to read and process them – I am still contemplating mine a few weeks after receiving them, as it gives you plenty of information to process – you can be also matched to the suitable practitioners & therapies that will help you achieve your goals. When it comes to setting goals most people tend to focus primarily on weight, energy, stress and sleep. When you look across the wellness landscape, it seems to be growing exponentially, but often the list of preventative therapies and practises can be fragmented and confusing to navigate, especially when one thing might work for your friend, but not you necessarily. And the nutritional advice is often given to us by people who aren’t actually qualified to give it to you or whose suggestions aren’t backed by scientific findings (have you watched recent Horizon’s documentary ‘Clean Eating: the dirty truth’ on BBC2 narrated by Giles Yeo?) or is based on the latest trends, which are often not coordinated with specific health goals or personal genetics. Lorena and her team extensively interview (based on their internal ‘code of ethics’) and test practitioners before they join the iamYiam rota of practitioners on the website. When they do, mini-video profiles are posted online about each one of them, which will help you form an initial opinion and decide who you want to potentially book in order to help you achieve your goals and build the right foundations. In each case effective activity and nutritional plan will be available, based on your aspirations and weakest genetics characteristics according to the algorithm. After you order your test online, via iamYiam website, within a couple of days you receive a small, pretty box. Once you open it, read the instructions on the inside of the top lid of the box & register the barcode that is printed on the Collection Tube online. In the morning – the best time to provide the sample – brush your teeth, rinse the mouth with water and wait for ten minutes. After that you will need to spit in the collection funnel and I have to say, in retrospect, drinking some water beforehand is not a bad idea, as it will make you mouth a bit more ‘compliant’ to provide enough saliva. You only need a couple of mls of it, but in the moment in time it did feel like a small challenge. Once you completed this uncomplicated task, remove the funnel & give yourself thumbs up! Then you have to twist and remove the tip of the preservative sample enclosed in your kit and squeeze its entire contents into the Collection Tube. Screw the cap on tightly and shake the Collection Tube for 10 seconds to mix the saliva with the preservative. After that is it ready to be placed inside the biohazard bag provided, which you in turn have to place in the small padded envelope, seal it and place it, Matreshka Doll-like, into the pre-paid large envelope and drop it in your nearest Royal Mail postbox. After that you will have to wait about a month for your test results to arrive into your iamYiam customer account. The company let’s you know when it receives the sample (in my case, the following day) and when your results are downloaded into your account (in my case about three weeks later). During that time I filled in online questionnaire related to my goals (which you can easily change from time to time) and got helpful suggestions, which I took time to contemplate during the festive season. If in the run up to doing a DNA test you want to start making vigorous changes – don’t! Your DNA won’t be changed for better or worse just because you decided to exercise for a few consecutive days and then drink green juices or kombucha – your DNA is there and it won’t be changed or ‘swayed’ by the good or the naughty behaviour prior to the test, but the knowledge that you will get, when you receive the results, will give you choices and tools that, if you decided to use them, can and will improve your wellbeing and long-term health. Fact! And so is the combination of Data, Health and Genetics that is unique to YOU. When you have the result and might decide that you might want a personal trainer, iamYiAm won’t recommend one, but they have a rota of therapists in different fields who might help you guide expertly towards achieving your goals, by optimising efficiency and helping you ‘match’ to the appropriate therapist or practitioner. After you have information based on your DNA on say how you process proteins, you will also have the answers to how your stress affects the way you break nutrients down. At the moment there are more women who chose to do DNA testing than men and according to Lorena iamYiam platform is for professional, educated people who are open to ideas and like to see science and data combined in one place. They want effective information that will help them start making small changes that will lead to the biggest impact, based on the parameters that YOU CAN DO something about. Genetic profiling will translate 40 DNA parameters across Health, Diet, Nutrients and Fitness, such as predisposition to Diabetes, Obesity, Hypertension, Heart Disease, Caffeine Sensitivity, Lactose or Gluten Intolerance, Endurance, Vitamin requirements, Mechanics of Ageing, Metabolism, Injury and Repair, Aerobic Capacity, Muscle Fatigue and others. When you get access to your report online, it might seem initially overwhelming and personally I think it would help to have a 30 min consultation included as part of DNA testing, in order to help you make sense of the results, but of course, it all depends on your own pre-existing knowledge on the subject. Personally and having talked about DNA testing with a few friends, I think that having a typed-up report, in addition to the online version you get, would be helpful as well. When I raised this point with Lorena, she kindly sent me the following comment: ‘We have strategically decided not to have PDF versions, as that encourages the user to read the results, but not to take action. If the results are available only online, then the call ‘to action’ to book a therapist or a nutritionist is much more handy and powerful, as an impetus to action’. Either way, I felt it was an important point to address as part of my overview of this service. Your DNA results aren’t going to offer you quick fixes and the resulting markers aren’t going to go away, but changing your mindset and lifestyle, taking into account your individual traits when it comes to health, fitness and nutrition can and will make a big difference. You can pop all the vitamins in the world, but they might not do you any good, unless your body is low on processing some, while having adequate supplies or production of others. Your DNA results will also help you understand why you crave certain tasting foods, like sweet or salty and will give you helpful suggestions on how to address it. This has been one of my personal ‘eye-openers’, that has already made me not only take notice, but to start implementing small changes. Another interesting thing about this company is the fact that Lorena writes weekly newsletters, called ‘2min Health Dose’, based on her own personal and professional experience, as well as her travels, giving you food for thought on such a variety of subjects, as how attention span is affecting longevity or why one person thrives on a specific diet, while another fails miserably to achieve results on it or why sitting is bad for us and not only because of its negative affect on posture. Only recently Forbes featured iamYiam as one of top trends for 2017 and I can see why – instead of buying an endless supply of the latest books, supplements etc. you can invest in a DNA test and then start the changes that will benefit you on many levels, including potentially a longer, healthier life-span. The test itself costs £387 (fully-priced), but it is worth subscribing to the website – doing a lifestyle questionnaire is free by the way – reading newsletters and keeping an eye on special deals, which happen on a regular basis. While I am still getting to grips with my own results – I expected to be sensitive to caffeine (call it listening to the signals that my body sends me), but was quite surprised about my sensitivity to dairy and the fact that my body is a lovely fitness machine of sorts, when it comes to muscle recovery after sports activity, for example. But it also helps bearing in mind a point that Lorena kindly clarified for me, when it came my initial surprise regarding my ‘dairy’ result: ‘the results are predispositions – therefore if you are predisposed to lactose intolerance – you might have that already – or not yet . The results would then indicate that you are prone to development it and that it would be advisable to lower your lactose consumption to ensure you do not trigger the intolerance. In terms of caffeine sensitivity – if the results indicate that you are not sensitive to caffeine – it means that your body processes caffeine very well and eliminates it from the body in an efficient manner . If you have a high caffeine sensitivity it implies that your body is slower at processing caffeine and there slower at eliminating it from your body.’ All this only reinforced my belief that knowledge about health and wellbeing is power when it is based on scientific facts and taking into account your own unique traits. My DNA results also highlighted some potential health issues that surprised me, as they don’t run in the family medical history, so I certainly feel wiser and more equipped to move forward and make the right choices for my own well-being. Another thing worth noting is the fact that Lorena is not only a super-achiever by nature, but she actually practises what she recommends and ‘sells’, being a perfect ‘role-model’ for her brand. She works hard, always looking for things to improve in terms of the service offered, but she also makes sure she looks her own lifestyle and mindset – after all, if you don’t practise what you tell your potential customers about, are they going to trust your judgement? Women in particular are prone to a guilt complex when it comes to looking after themselves, forgetting that they can’t look after others, if they don’t look after themselves in the first place. Note on privacy: For those of you who might have some personal concerns about privacy, I asked Lorena for the clarification and here is what she replied: ‘Your personalised data isn’t shared with third companies and the sample is destroyed upon processing. Equally, no-one has access to your results. The report is pulled from the system, so the company knows who has done and accessed their test results. The company doesn’t access user results’. I want to finish this post with the following thought: isn’t it time we started taking responsibility for our own lives by looking after our long-term health and wellbeing? We can’t expect anyone to do it for us, nor take advice mindlessly and then blame the person who gave us advice, if things don’t work out according to how we ‘presumed’ they would. Being healthy and well isn’t about five minute cures, cold-pressed juices, celebrity fitness videos or latest supplement launch – it is about knowing yourself and your body and doing things for your own benefit, based on scientific facts and your unique traits.